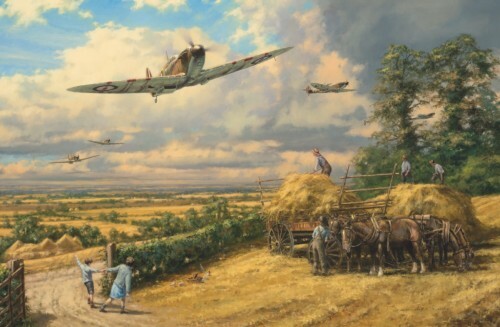 The story of the Battle of Britain is brought to life through the paintings and drawings of some of the world’s foremost aviation and military artists. Published to commemorate the 75th Anniversary, this beautifully illustrated 128 page full-colour book, portrays these historic events with a visual clarity rarely seen before. Taking place from July to October 1940 the Battle of Britain, a battle of such crucial historic importance that it ranks alongside Agincourt, Waterloo and victory over the Spanish Armada, has inspired many books containing the results of much painstaking research. Yet, there are few visual records of the dramatic encounters that took place during the summer of 1940 as Nazi Germany prepared to invade Britain. 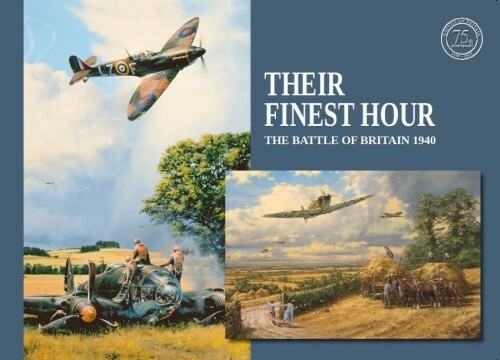 "Their Finest Hour" relives those historic events through the eyes of some of the world’s leading aviation and military artists as the young men of the RAF, though impossibly outnumbered, repelled the might of Hitler’s war machine. The work of four internationally recognised artists are featured in this book; Robert Taylor, Anthony Saunders, Richard Taylor and Gerald Coulson. "Their Finest Hour" leads us through the stages of the Battle of Britain. From the actions that led up to the conﬂict to the subsequent ﬁght to repel the Nazi invasion, we encounter the major events and other memorable stories that happened in that historic summer of 1940. The exceptional images of these world renowned artists help knit together this account of the Battle of Britain, creating a visually inspiring masterpiece. 128 page hard back case-bound book. THE COMMEMORATIVE LIMITED "75th ANNIVERSARY" EDITION BOOK AND PRINT PORTFOLIO. 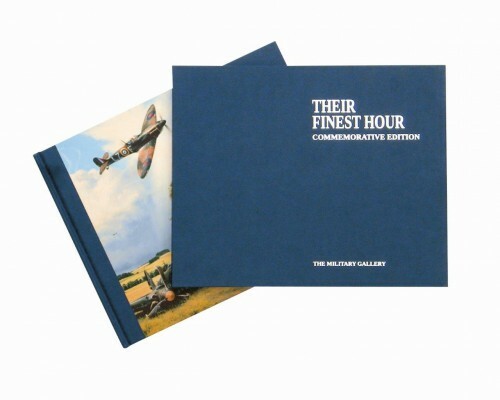 This prestigious limited edition portfolio, specially issued to commemorate the 75th Anniversary of the Battle of Britain, includes an individually numbered limited ﬁrst edition copy of the book THEIR FINEST HOUR which is presented in its own luxury embossed slipcase. Each book is accompanied by a matching-numbered copy of the limited edition print. Harvesting is brieﬂy interrupted as Mk.I Spitﬁres of 609 Squadron pass low overhead. The young pilots return to 10 Group Sector Station at Middle Wallop after successfully engaging Luftwaffe raiders attacking naval facilities on the south coast, August 1940. Overall print size: 31" x 23"